Integrates Guzzle 6.x, a PHP HTTP Client, into Symfony 2/3/4. Comes with easy and powerful configuration options and optional plugins. This bundle integrates Guzzle 6.x into Symfony. 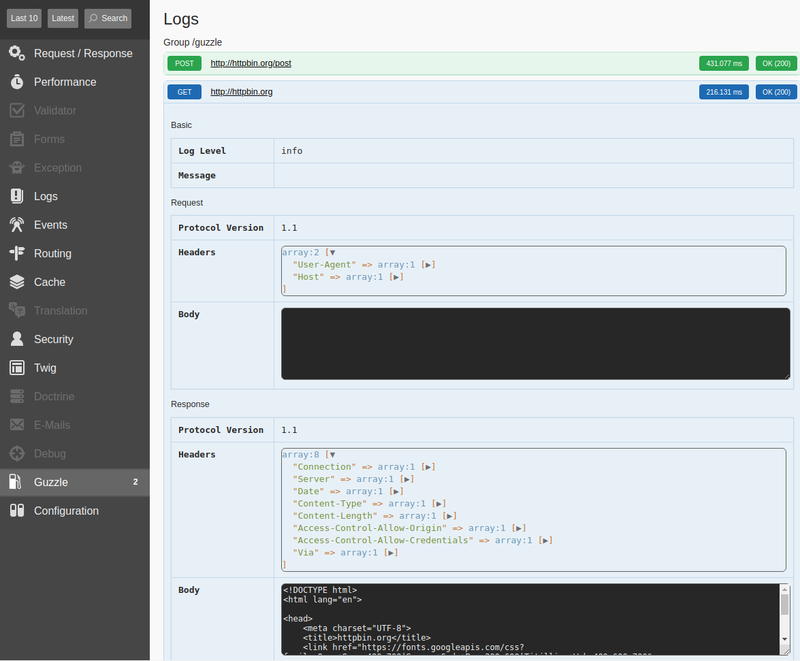 Guzzle is a PHP framework for building RESTful web service clients. GuzzleBundle follows semantic versioning. Read more on semver.org. To install this bundle, run the command below and you will get the latest version by Packagist. Note: we created Symfony Flex Recipe to speed up the installation of package. # NOTE: "headers" option is not accepted here as it is provided as described above. # Find proper php const, for example CURLOPT_SSLVERSION, remove CURLOPT_ and transform to lower case. Open Configuration Reference page to see the complete list of allowed options. This bundle allows to register and integrate plugins to extend functionality of guzzle and this bundle. The registration of bundles was changed in Symfony 4 and now you have to change src/Kernel.php to achieve the same functionality. Handling events. Events are dispatched before and after the request to the remote host. Your event Listener, or Subscriber MUST implement GuzzleBundle\Events\GuzzleEventListenerInterface. Events dispatched are eight_points_guzzle.pre_transaction, eight_points_guzzle.post_transaction. The service on the tag, is so that if you have multiple REST endpoints you can define which service a particular listener is interested in. You can change message format by overriding eight_points_guzzle.symfony_log_formatter.pattern parameter. See allowed variables here. Adding aliases: If you want to use different names for provided services you can use aliases. This is a good idea if you don't want have any dependency to guzzle in your service name. Use Guzzle MockHandler in tests : If you want to mock api calls, you can force the clients to use the Guzzle MockHandler instead of the default one.  If you would like to contribute to the project, please read the CONTRIBUTING.md. Join our Slack channel on Symfony Devs for discussions, questions and more: #8p-guzzlebundle.  Thanks to the contributors who participated in this project.